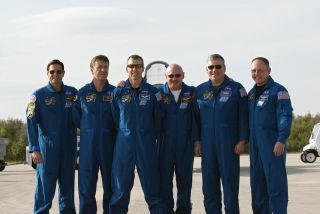 The six astronauts slated to ride the space shuttle Endeavour on its last journey to space next month arrived at NASA’s Florida spaceport for a launch dress rehearsal Tuesday (March 29). The crew, led by veteran shuttle commander Mark Kelly (husband of wounded Arizona congresswoman Gabrielle Giffords), is scheduled to launch on April 19 for a two-week trip to the International Space Station. Liftoff is set for 7:48 p.m. EDT (2348 GMT). "We like coming in to see the space shuttle," Kelly said in a televised statement after his crew joined him on the tarmac. "It's always exciting, especially when you're three weeks away from launch." The astronauts will stay in Florida through Friday to perform a launch countdown rehearsal called the Terminal Countdown Demonstration – a traditional practice session before every shuttle flight – as well as other training activities. Kelly and Endeavour's pilot Greg H. Johnson will also practice landing the shuttle by flying modified Gulfstream jet that NASA calls the shuttle training aircraft. Kelly has said he hopes his wife will be well enough to attend his launch in person from Florida. Giffords is recovering in Houston after being shot in January while speaking to constituents outside a Tucson grocery store. Kelly has said she's making remarkable progress in recovery and wants to attend the April launch. After this mission, NASA has only one more space shuttle flight planned – the June STS-135 mission of the shuttle Atlantis. The space shuttle orbiters are to be retired to museums after their final flights so NASA can transition to a new program aimed at sending astronauts to an asteroid and Mars.